May was a great month here in Cleveland. The weather has finally started to warm up a bit and we have been spending a lot more time outdoors on walks and mingling with the neighbors again. We are also in the process of meeting with contractors and finalizing the plans for a new deck and paver patio. I am so excited to share with you the transformation of our backyard into a beautiful outdoor space for relaxing and entertaining! All of this talk about outdoor spaces has really gotten me excited about the Summer and spending a lot of time outdoors!!! The Summer is by far my favorite time of year in Cleveland and I can't wait for all of the Summer memories that lay ahead of us. With that said, here is what I have been loving in May. I am loving the Ashmore 7 piece Dining Set right now from Sears. Our small table now only seats four which has really limited us from entertaining anyone else but ourselves! A larger table will really come in handy when we have friends and family over for BBQ's this Summer. I also loving this set from the Rolston collection at Target. It would be the perfect conversation set for the paver patio. This Martha Stewart living set from Home Depot would also be perfect for the paver patio. It includes a fire pit which will be wonderful for making S'mores at night with the family! I am still loving my new iPhone, it continues to amaze me everyday on what it can do. It really has made my life easier in responding to personal email, organizing my calendar, and keeping me up to date on all of the latest (Blogger) news. It was so hard to narrow down what my favorite app was of the month, there were just so many. However, I think the IHeartRadio App won out in the end. This app is amazing. It was created by The Clear Channel network and is a library of every radio station they own in the United States. 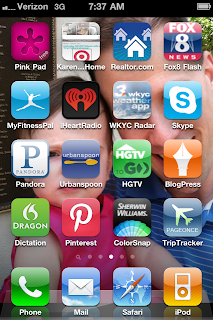 You have live music streaming from your phone from anywhere in the country! This app has really come in handy at work. My cubicle sits in a location where I get absolutely zero radio stations. It can make for some really boring and quiet days in the office crunching numbers. With the IHeartRadio app, I have been listening to radio stations from Atlanta, Nashville, Charlotte, and even right here in Cleveland. I posted a few months ago about recommending a foundation that you love. Thanks to all of you that responded! I decided to try Maybelline's mineral foundation. I don't know if I just got lucky and picked the correct shade right off the bat or what but I am in love! It marches my skin perfectly and you can't even tell I am even wearing it. It doesn't give you that "make up line" around you jaw line either, it blends that well. I would highly recommend picking up a bottle on your next trip to Target! I can't even tell you how many bags of this stuff I have bought over the last month. It is just that good. I love all of the Steamfresh products but this one has really taken it to another level. I have been adding it my salads lately along with low fat shredded cheddar cheese, a dollop of low fat sour cream, and tri-colored tortilla strips. I have been enjoying the best Southwestern corn salad ever!! It is both delicious and healthy. One of my new favorite Bloggers I discovered this month has to be Natalie Catherine from The Busy Budgeting Mama. Natalie owns her very own Party Planning and Paper Etsy shop called 'Pretty Paperie' and also has an eye for beauty products! One of her many posts recommended Maybelline's Full and Soft mascara. Her lashes looked so full and long that I had to go try it out for myself. And for the inexpensive drugstore price, I knew I couldn't go wrong by just picking up a tube on my next Target trip. Well, I was sold. I don't think I will ever change my mascara again. 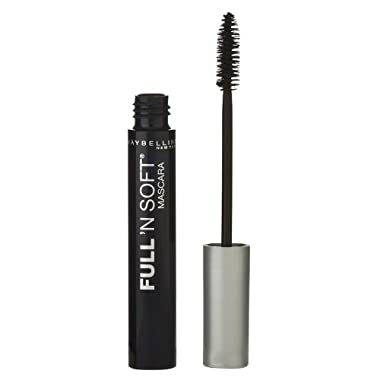 My lashes are exactly as the product says, full and soft!!! when are you going to jump on the words with friends bandwagon!!!???!!!?? I love all of the furniture! My favorite season is summer also, and we spend lots of time outside on our deck this time of year. I received an iPod touch for a Christmas gift last year. It is basically an iPhone without the phone. I LOVE it! And use it for everything. Thanks for the Iheartradio tip! I would also recommend, if you don't already have it, WeatherBug. I use it daily. I love the iheartradio app too. It's great when you're traveling too. I had an unfortunate incident with my iPhone last night. I'm counting the minutes until lunch when I can go get a new one. I know it's awful but I'm lost without it. I love the patio set with the fire pit. That would be nice to have! I love Steamfresh - when I'm trying to be skinny, I eat an entire bag every day for lunch. I love the patio sets, and steamfresh. I've not bought the corn though. I love the patio set! We love being outside too, especially the boys. Oh wait, that's everyone but me. Haha! Thanks for linking up with us again at the Sit and Relax weekend hop! Speaking of weather. . we tried to go strawberry picking today and got poured on! Now, the sun's out. :) I love the patio sets. How exciting to have a new outdoor deck and patio. Have a great weekend! Oooh, I love that outdoor furniture! And I LOVE your new header, so cute!! !